just a little something for your wednesday. Thank you thank you thank you for sharing. I love old unlicensed costumes. 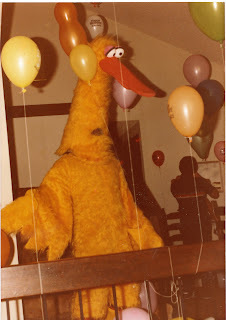 i have a picture of me at my 5th birthday party (1984) with a pac man piñata in the background. early childhood was the best for pictures, particularly in the 80's. i have a few more gems that my dad has sent recently that may be making an appearance sometime soon. wow, I'm speechless. Can't wait to see more of these. this just made my day!!! thank you! is that your DAD in the costume?? @memelodia p.s. apparently GAH! is my new favorite thing to say around the house. I think of you every time. woah, this looks straight out of a david lynch film! yes that is my dad. he really loves costumes. I love his nose peeking out. acks, that beek! so cute! !